Summer is finally over and now it's time for some pleasantly cool weather. Not that you'll want to go outside and enjoy it with 50 new anime in the pipeline. But how do you know which ones to watch? Check out the trailers and brief blurbs to see which of them catches your interest. What It’s About in One Sentence: The second season of a futuristic crime drama anime set in a world where your mental state can be measured and you can be arrested or killed on the spot if you are deemed mentally unstable. What It’s About in One Sentence: When an alien parasite takes over a 17-year-old boy's hand, they form a symbiotic relationship and battle the other parasites who only seek to use humans as a food source. What It’s About in One Sentence: The human race attempts to take back the face of Mars from the genetically-altered cockroaches they used to try to terraform the planet. What It’s About in One Sentence: Long after the time of the original Gundam series, a high school boy manages to capture a Gundam from a space pirate when it attacks the space elevator his class is traveling on—but stranger still is the fact that the Gundam accepts him as its new pilot. What It’s About in One Sentence: The second season of an anime set in a world where you can build your own custom Gundam model and then pilot it in a VR game. What It’s About in One Sentence: Instead of inheriting the throne, a princess is forced to ride a giant mecha and hunt dragons from another dimension because she is one of the few humans unable to use magic. What It’s About in One Sentence: When gigantic interdimensional creatures break through into our world, it's up to a team of warriors armed with alien weaponry to fight back. What It’s About in One Sentence: A short-form anime where androids have taken over the world and are culling the human population—but a small group of humans are fighting back. What It’s About in One Sentence: This anime is the second season of Selector Infected WIXOSS and follows a group of girls playing a popular trading card game where, if you win enough, your greatest wish will be granted—though there is always a dark price. What It’s About in One Sentence: The sixth season of the Cardfight!! anime, taking place three years after the last season. What It’s About in One Sentence: This short-form anime follows three sisters living in space. What It’s About in One Sentence: The continuing adventures of a group of people trapped in a video game's fantasy world and their attempt to build a new society there. What It’s About in One Sentence: When the king grows ill and the king's advisor seizes power, the prince heads off on a search to find descendants of the mystical Gold Knights to help him retake the kingdom. What It’s About in One Sentence: After his country is invaded by a female warlord, a young archer fights the warlord and fails—only to end up as her servant afterward. 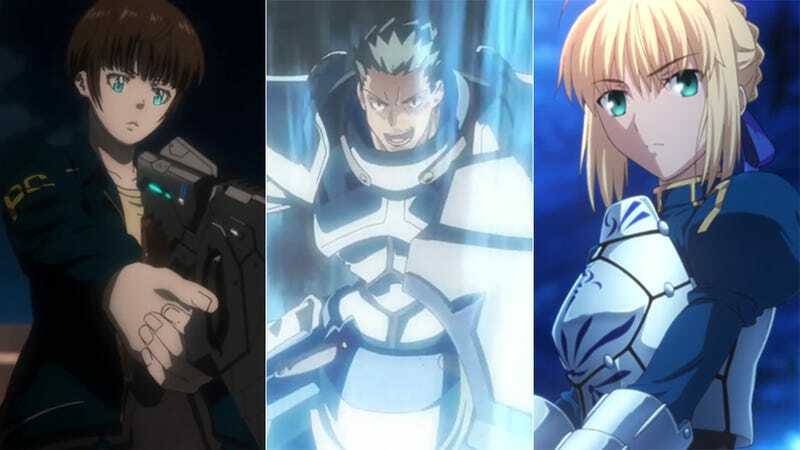 What It’s About in One Sentence: Based on the visual novel Fate/Stay Night, this anime follows that game's second route through the story, thus focusing on Rin instead of Saber. What It’s About in One Sentence: After the man she loves kills her father, the king, to take the throne for himself, a princess finds herself on the run, with her loyal bodyguard as her only companion. What It’s About in One Sentence: After the Holy Knights stage a coup d'état and kill the king, the princess escapes to find a group of previously defeated evil knights—the “Seven Deadly Sins”—and gets them to aid her in retaking the kingdom. What It’s About in One Sentence: The second season of an anime about two former soldiers and a young female magician hunting for the various parts of the deceased evil emperor's corpse. What It’s About in One Sentence: The gods and daemons each have half a key to the prison of a monster capable of destroying the world—until the day a human woman steals the gods' half of the key, that is. What It’s About in One Sentence: This new anime by the acclaimed Studio Ghibli is about the young daughter of a bandit chief and her adventures in the woods. What It’s About in One Sentence: The continuation of the second season of an anime about a man who helps people that are being troubled by supernatural beings. What It’s About in One Sentence: In the early Meiji Era in Japan, three boys transport criminals to an island prison in the middle of a lake. What It’s About in One Sentence: A group of young people in a town where a giant disk fills the sky begin to unravel the mystery of the disk and their connection to it. What It’s About in One Sentence: After a little girl summons a ghost, the ghost decides that he feels sorry for her and decides to protect her instead of haunting her. What It’s About in One Sentence: This is a short-form anime about a high school boy who lives alone—until the day a merman moves into his bathtub, that is. What It’s About in One Sentence: A group of high school kids (and an elementary schooler) all received super powers; but as no villains appeared for them to battle, they've simply continued living their normal everyday lives. What It’s About in One Sentence: After a mysterious event causes worldwide destruction killing many, a boy enrolls in a magic academy to try to bring back his cousin. What It’s About in One Sentence: A short-form anime about the anthropomorphic personifications of the Sega Dreamcast, Sega Saturn, and Mega Drive attending school at the SeHaGaga Academy. What It’s About in One Sentence: This is the story of five girls working in the anime industry and the everyday problems they encounter. What It’s About in One Sentence: A boy with a “twin-tail” hairstyle fetish finds he can turn into a superpowered twin-tail girl after his encounter with a girl from another world. What It’s About in One Sentence: A shy boy starts working at a manga store where his fellow employees all have their quirks—to say the least. What It’s About in One Sentence: This short-form anime follows the misadventures of a normal young woman and her hopelessly otaku husband. What It’s About in One Sentence: A self-proclaimed genius high school boy is tasked with attracting 100,000 visitors in the next two weeks to an amusement park or else the park will be forced to close. What It’s About in One Sentence: When a high school girl who has pretended to have a boyfriend for years is caught in her lie, she enlists a boy at her school to stand in as her boyfriend—only to find out he is a total sadist who treats her like a dog. What It’s About in One Sentence: In this short-form version of an anime classic, Tenchi must go undercover as a teacher at an all-girls school to save the world. What It’s About in One Sentence: A high school boy (and library club member) who enjoys nothing more than reading alone in his high school's gigantic library finds more and more girls being “shepherded” into his club. What It’s About in One Sentence: As a high school astronomy club gets ready for the culture festival, there start to be more and more reports about mysterious incidents happening in the soon-to-be-closed club building. What It’s About in One Sentence: This anime is about an all-girls academy, which is more prison than school, that gets its first male student. What It’s About in One Sentence: This short-form anime follows a girl in a confectionery school and the various charming men she encounters. What It’s About in One Sentence: An anime based on an iOS/Android dating game set in a high school where you can choose to date five different girls. What It’s About in One Sentence: After his mother passed away, a young piano prodigy had a mental breakdown and was forced to give up playing—until years later, when a young violinist comes crashing into his life. What It’s About in One Sentence: A middle school boy who loves to dance and a girl who has been practicing dancing in secret meet and learn more about the joys of dancing together. What It’s About in One Sentence: Based on a collectible card game, this is the third season of an anime about a school where girls train to become pop idols. What It’s About in One Sentence: The second season of a short-form anime about twin bear sisters who continuously try out new jobs and give their all even if they fail. What It’s About in One Sentence: Based on a picture book series, this anime follows a dog who flies around in a balloon. What It’s About in One Sentence: In this spin-off of Detective Conan (Case Closed), a normal teenager takes up the mantle of the world famous Phantom Thief after his father, the previous Phantom Thief, is murdered. What It’s About in One Sentence: This is the third season of a short-form gag-based comedy about a young bug who goes to “biting school” so he can inherit his family’s “biting shop” business. What It’s About in One Sentence: This anime follows a thief who can steal anything in the world—almost like magic. What It’s About in One Sentence: The second season of an anime about a young otaku who wanted to join the (recently disbanded) anime club at his school and found himself joining the cycling club instead.